Israel has carried out a second night of air strikes against targets in the Gaza Strip. Palestinians say one of the targets was a training facility for the military wing of Hamas, and smuggling tunnels along the Egypt border were hit. Medical sources say five people were injured in the attacks. The Israeli strikes took place hours after Palestinian militants fired rockets at an Israeli town situated 30km from the Gaza-Israel border. Recent weeks have seen an increase in mortar and rocket fire from Gaza after months of relative calm. Israeli army sources say that since Wednesday Grad rockets were fired near the towns of Kiryat Gat, Ashkelon and Lachish. They landed in open areas and no-one was hurt. However on Monday, an Israeli Bedouin woman was lightly wounded by shrapnel when a rocket fired from Gaza exploded near Ashkelon. The last major escalation of violence in and around Gaza followed an incident in April when an Israeli school bus was hit by a missile fired from the Palestinian territory. An Israeli teenager later died from his injuries. Israel responded to that attack with a series of air strikes that killed at least 19 Palestinians. It was the deadliest violence since Israel's 22-day devastating assault on Gaza between December 2008 and January 2009. Since then the resumption of an uneasy and informal truce has kept attacks by both sides to a minimum. A small Salafist militant group, which did not agree to a ceasefire, has claimed responsibility for firing the latest rockets. Hamas, which governs Gaza, is said to have reined in most such groups. Israel says it holds Hamas responsible for all attacks coming out of the Palestinian territory, even if other militant groups carry them out. Reports said that the latest air strikes hit a training facility for al-Qassem Brigades, the military wing of Hamas. 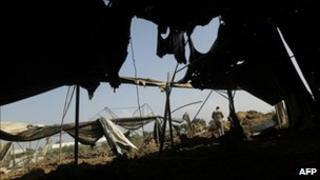 A chicken farm near Deir al-Balah in central Gaza was also targeted as well as tunnels near the southern town of Rafah. The Israelis charge that Grad rockets are smuggled into Gaza through tunnels under the border with Egypt along with other contraband. Grad rockets have a longer range than the homemade rockets Gaza militants often fire at southern Israel.